PUNDITS are tonight declaring the incumbent Member for Lyons to have been defeated in today's Federal Election. 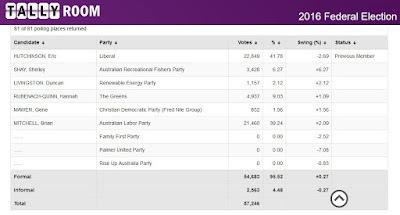 Eric Hutchinson won the seat for the Liberal Party at the 2013 election and despite receiving the most votes in today's double dissolution poll he is expected to lose to Labor's Brian Mitchell following the distribution of preferences. 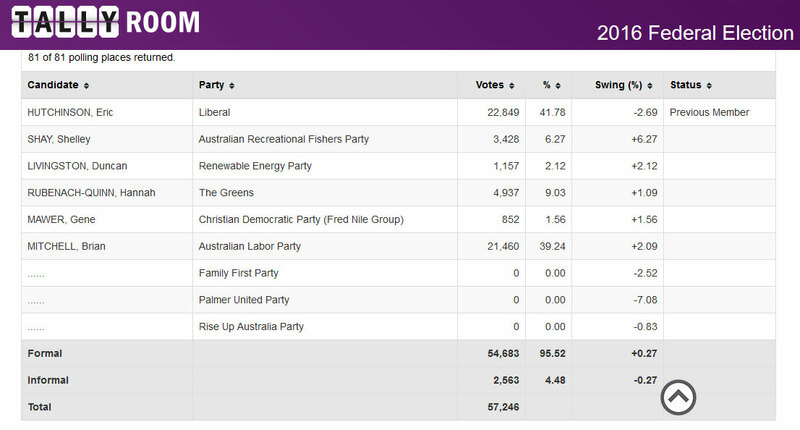 UPDATE: The Australian Electoral Commission has issued its final count for Lyons for tonight. With the votes from all 81 polling booths counted, no candidate has achieved quota on first preferences. Just a clarification. Hutchinson did not receive the most votes. He received the most primary votes. These show that more people did not vote for him in the primary position than did, and this is why we have a preference system.